Minister Ariel presents data showing a dramatic decline of illegal Bedouin construction. Next year's goal: an end to Illegal construction. Agriculture Minister Uri Ariel (Jewish Home) is pushing to end illegal construction and land grabs in the Bedouin sector in southern Israel, as his ministry reports a sharp drop in unauthorized construction in the Negev. According to a report by the Agriculture Ministry, the number of buildings illegally constructed in the Negev plummeted by 78% over the past few years, including a nearly 50% drop in 2017 as compared to 2016. The ministry also reported that enforcement operations against illegal buildings was on the rise. “The construction of illegal houses in the Bedouin sector in the Negev was cut in half in 2017, compared to 2015. 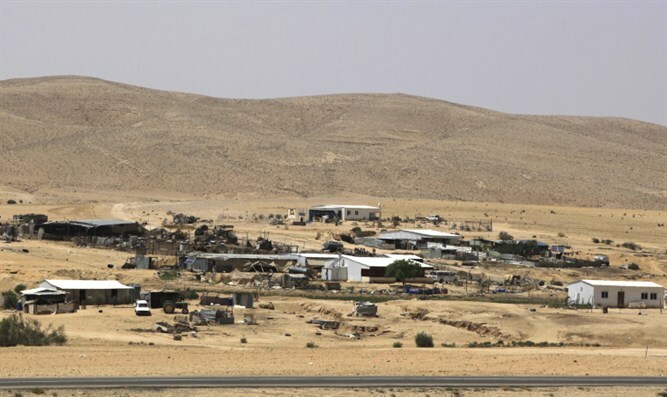 In 2014, 3,421 illegal structures were added to the Negev, compared with almost double in 2015, when 6,211 illegal building were built in the Negev, a 45% decline. Illegal construction in the Negev, in 2015 the enforcement authorities demolished 2,172 illegal structures in the Naqab, and the number of demolitions was 2,523 in 2017. A 16% increase compared to 2015." Minister Ariel said that the encouraging data indicate a proper and effective integration between determined enforcement in the field and intensive marketing of land to Bedouin citizens. Ariel added that given the steep drop in illegal construction, a total end to unauthorized construction in the south is a realistic goal. "There was a sharp drop in the number of new illegal homes since 2015. In 2015 there were 4,039 structures in illegal construction, while only 898 illegal structures were added in 2017. A few months ago, data were presented on the construction offenses of the Bedouin sector, which also showed a significant decrease in the extent of the illegal takeover of land outside the blue line of the settlements. " In 2015, illegal construction outside the Blue Line in the Bedouin settlements in the Negev was recorded as 3,900 structures, while at the end of 2016 there were only 1,700 illegal structures outside the Blue Line. A decrease of 56%. Ninety percent of the illegal structures were built up to 50 meters (164 feet) from existing buildings, so that the phenomenon of land expansion and control was dramatically reduced. “I am happy to announce a revolution in the Negev regarding the illegal construction. The enforcement agencies, together with the proper activities of the Bedouin Settlement Authority according to my instructions, created a new situation in the Negev: in 2019, we will aspire to zero illegal construction in the Negev. We have increased the means of enforcement, we have demonstrated the validity of an attack along with significant land marketing, and we are on the right path to dramatically reduce and later eliminate the illegal takeover of state land in the Negev. The Negev will no longer be a no-man's-land area without governance," said Ariel.